Spent the entire afternoon yesterday photographing awards presentations as my departing boss made his way around the building thanking employees for the work they have done. It is easy to forget that while these photographs (grip-and-grins) get a bad rap and may never make it to your portfolio or website, they are important to the person being recognized. In fact, I have a photograph shot by a Navy photographer of me as a ten-year-old standing with my grandfather during his retirement ceremony from the Naval Air Development Center in Willow Grove, Pa. That photo reminds me daily to give my best during every photo assignment both big and small. 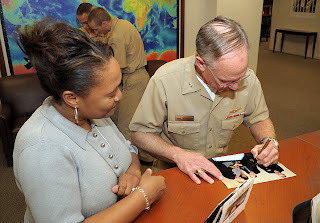 I was reminded of that yesterday as I was standing around between presentations, an employee got my attention and asked if I thought it would be okay if the admiral signed something for her after the ceremony. I told her I didn't think it would be a problem and that is when she produced a photograph I had taken of her and the Admiral in 2009 during a cake cutting to celebrate the Navy's 234th birthday.